One of our favorite areas in the Hudson Valley comes alive with these can’t-miss experiences. The first thing that comes to mind when I think of getting some R & R that will tremendously rejuvenate me isn’t the beach nor some far Mediterranean seaside. When I close my eyes I want to hear chirping birds, the sound of rustling leaves, and probably the slow hush of a river. This is what I always envisioned as a perfect getaway. Far enough from the city to feel like you’re out in nature, yet close enough not to get exhausted during traveling. On your way upstate (it’s right off the highway 30 minutes before you reach Buttermilk Falls Inn), make sure to stop in at this outdoor wonderland. This gorgeous art center spans over 500 acres of rolling lush hills, rivers, wildlife and beautiful sculptures ranging in size from tall to small – it almost feels extra-terrestrial! Sometimes there are no words to describe the feelings of tranquility while viewing these pieces except for seeing it yourself in person. The absolutely massive sculptures have space and distance to enjoy from all angles. The permanent sculptures of Moore, Calder, Nevelson, Noguchi, are large and yet also somehow small within the context of the vastness of nature. 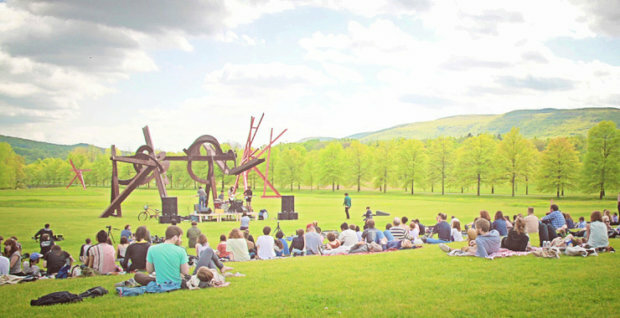 Visitors to Storm King Arts Center are able to picnic on the grounds or rent bikes to better cover the picturesque layout. The perfect spot for a day date or to bring a group of fun-loving friends! I would certainly recommend coming in the afternoon (the daily 2pm tour introduces various aspects of Storm King’s collection and program), but with enough time to view the park as it closes around 5pm and takes at least 3 hours to view properly. There are fantastic shuttles that take you around to give you a quick overview. 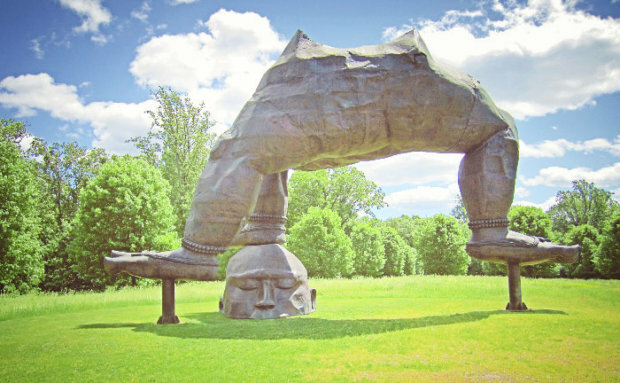 You can als experience outdoor yoga among Storm King’s sculptures Saturday mornings from June through September. Some tips: Don’t go at the end of the day (make sure to leave yourself plenty of time – this place is huge), leave the dog at home (as they’re sadly not allowed on the property – I’m guessing because they scare the ducks and other wildlife), bring your own healthy snacks (there is a cafe, but it’s small and only sells soups, sandwiches, hotdogs, and mac and cheese), and don’t bring your own bike (like a movie theater that makes you buy your snacks on premises, Storm King Art Center makes you rent and use their bikes). You’ve really convinced me to book a stay there. I really like how the Buttermilk Inn looks like. It’s plain and nothing really too fancy, but the surroundings and the views are really great. I will literally turn off my phone just so I can really relax during my stay here. No social media or gadgets aside from taking pictures. No WiFi for me and no data connection either. I just want a vacation that’s away from all the pressures of daily life and I just want to chill! It must be very fun to travel to a lot of places. If only I had that luxury too. Sorry, but I’m not a fan of historic places. It’s just nice to take pictures but it just doesn’t feel fulfilling for me. Rhineback looks like a very colorful place to visit. It’s an eye-candy to look at. I bet pictures and OOTDs would be amazing here. But I prefer the scenery in Buttermilk more than the Hamptons style one. Sometimes, luxurious hotels aren’t the key to a great vacation. It’s the amount of lush greenery that I see around me. We’re always surrounded by hotels in the city anyway and I want a change of scenery when I’m on a vacation. I don’t even mind sleeping in wooden beds. Where’s the falls? Of all the things… That’s what you didn’t show. A facial sounds really good right now. I agree with your philosophy that our skin will reflect what’s on the inside. I’ve never encountered Babor products, but if I ever encounter them I’ll avoid it because I don’t want toxic products on my skin. Cucumber toner sounds really great and refreshing on the skin, I would also want to try that apple honey mask. It probably smells like delicious pie. I really want to try. I’m asking my friends to go here with me. If you enjoy places like this or museum like visits, this can be a good place. But if I wanted R & R, I would rather go elsewhere. I kind of feel the same. This place looks beautiful but there isn’t much to do. The Vanderbilt mansion looks really cool. It looks like something from the movies. It would be really great to take pictures here. Llamas are so cute. I like that the wildlife here is very abundant. I really think that there should be more places that are like this– a sanctuary for wildlife and a haven for people to enjoy nature at its finest. I find it really rare for places like this to be frequently be visited by people, unless you’re a nature lover and you’re in a vacation. But places like this need regulars so they can appreciate the beauty of having nature around us instead of skyscrapers.